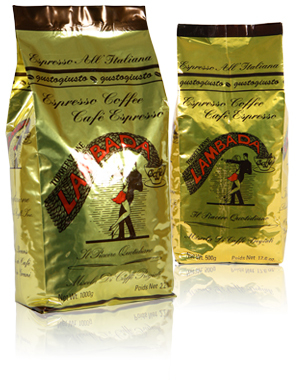 We take pride in roasting our premium Lambada Espresso coffee. Lambada is roasted in a traditional Italian roaster, with a variety of premium Arabica beans, creating a rich colour and a nutty aroma. Our Italian roast gives you the aroma and experience of drinking espresso in European coffee bar. Our beans are lightly roasted and bagged fresh daily. If you are an espresso coffee lover, this is the espresso experience for you. Espresso was invented in Italy by an enterprising soul who was seeking a way to prepare coffee in less time, in order to serve commuters rushing to catch trains. Which is somewhat ironic when you think about it, because coffee lovers in Italy (and all over the world) now prefer to savour their espresso in long, slow sips.